Gwenie’s Story: The Only Thing To Fear is…Well, Everything and Everyone. 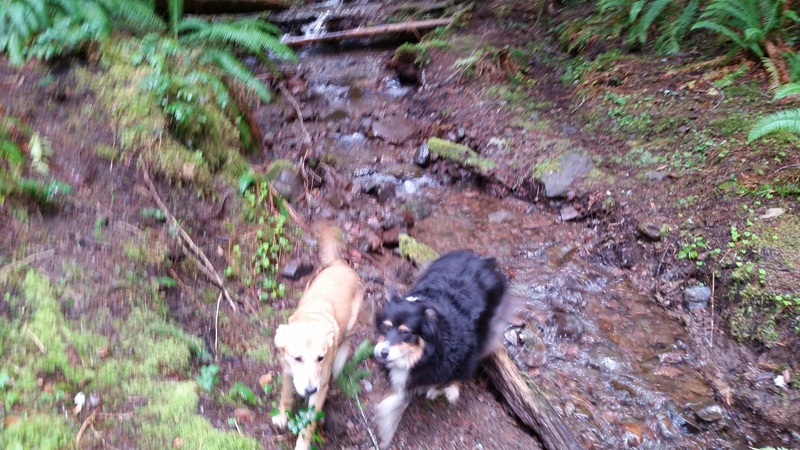 As you may recall, Gwenie came to me via Puppy Rescue Mission, Cassie Wyllie and an epic aerial journey that took her from Amman, Jordan to the green Willamette Valley in Oregon. Since arriving here in November 2014, Gwen has eaten one of the couches, dug up the entire back yard and redecorated the house with random things she has found in her foraging expeditions. Most recently, she has taken to leaving piles of Legos, barbecue brushes, brooms, bits of plastic Easter eggs and other random stuff heaped before the front door. She lays next to her little offerings, waiting for our return so that she may jump all over us, thus ensuring our clothes are properly coated with muddy puppy prints. I love this dog. I’m not sure the house is going to survive her. Early on, we realized this pup needed exercise. Problem: she doesn’t want to leave the yard. Next Problem: she hates car rides and vomits a lot in them. 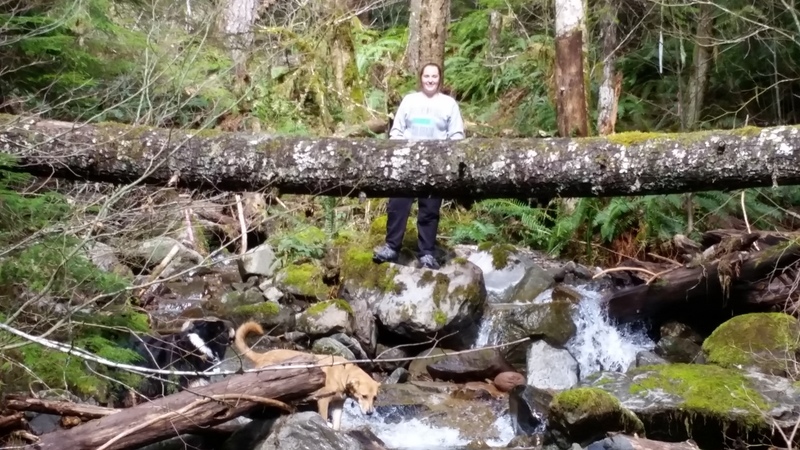 Recently, I took her up to the cabin in the Cascades I use as an alternate, back up writing lair when I need to focus. This was the second attempt to get her up there. She sat in the back of our Explorer thoroughly unhappy, howling and making whiny, gurgling sounds. About an hour into the drive, she projectile vomited all over the back of the car. I mean, barf was dripping from the ceiling, splattering the windows, etc. The smell was beyond description and almost rivaled post-Katrina New Orleans. She yakked twice more before I got to our woodland destination. Walking her through the neighborhood is problematical as well. At first, the neighbor’s statue terrified her, and getting her beyond it turned into a major hurdle. I am pleased to report that we’ve overcome that one. Now, any time she sees people, or another dog she doesn’t know, she tries to jump into my arms Scooby-Doo style. Since she now weighs over forty pounds, it can be a bit disconcerting when she flings herself at me all amped on terror-spawned adrenaline. Now, this dynamic totally changes if Ryder is with her. Ryder is our seven year old Aussie Shepherd and fullback for the street football squad here. He is a brilliant animal, knows the difference between a pro-set and an I formation, can run a couple of pass routes and loves the pitch & sweep. 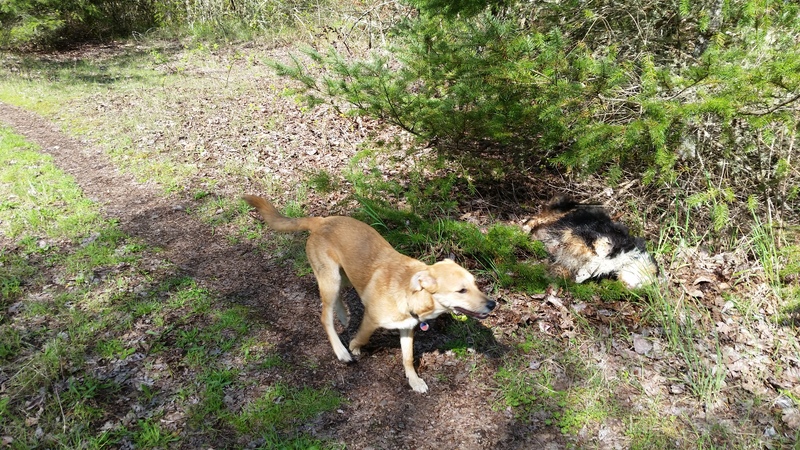 He is fearless, perpetually happy, and Gwenie has fallen into his orbit. She reveres him and is so connected to him that if he leaves the house without her, she flips out and throws herself against the front door and utters long, tortured howls. If he gets in the car, she will consent to getting in with him. If he walks through the hood, she wants to be right beside him. And if we’re out walking and he gets ahead, she will grow anxious and start bucking against the leash to try and catch up. With Ryder around, she is fearless and will adventure anywhere. After we discovered this, we took them over to the beach in Newport. 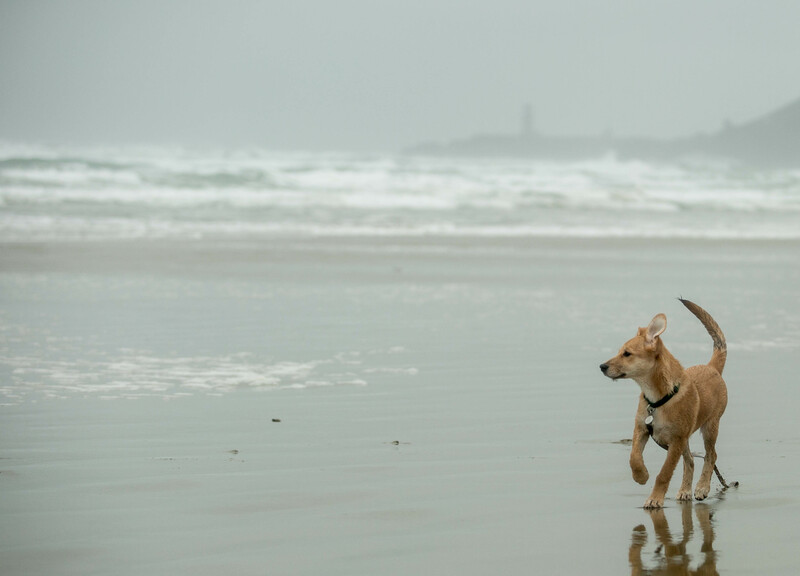 It was raining and cold, but Ryder jumped right out of the car and bolted for the water. He and my daughter, Renee, love to play in the surf together. Gwenie padded after them, unsure of the wet sand at first. Gradually, she grew emboldened. 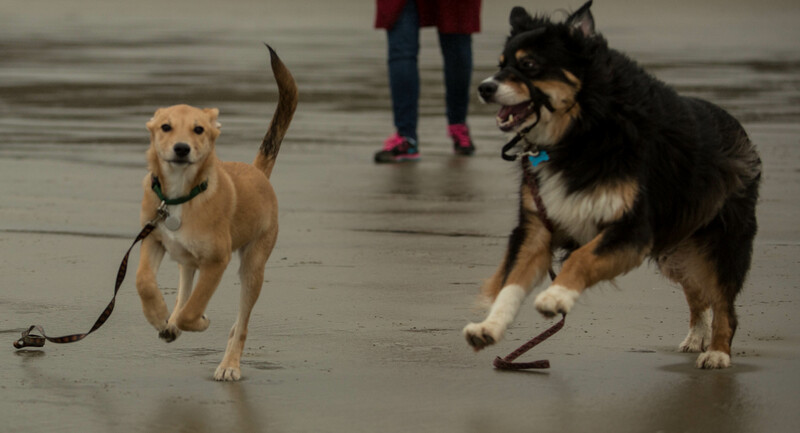 When I took her off the leash, she streaked up and down the beach, chasing Ryder and playing gleefully with him. Alone, she never would have even gotten into the Explorer. 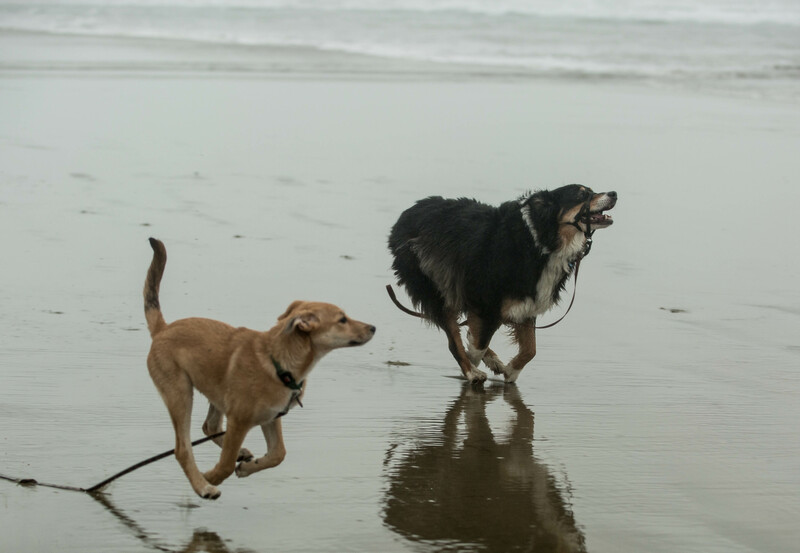 With Ryder, well, she gets by with a little help from her friends. That’s what friends are for! A lovely blogpost, thanks a lot.